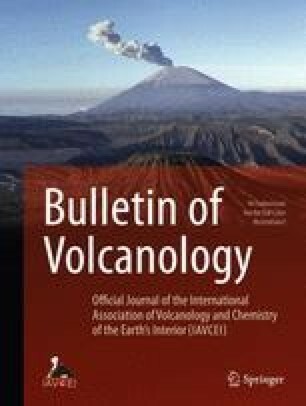 the Neapolitan Yellow Tuff (NYT) (12 ka BP) is considered to be the product of a single eruption. Two different members (A and B) have been identified and can be correlated around the whole of Campi Flegrei. Member A is made up of at least 6 fall units including both ash and lapilli horizons. The basal stratified ash unit (A1) is interpreted to be a phreatoplinian fall deposit, since it shows a widespread dispersal (>1000 km2) and a constant thickness over considerable topography. The absence of many lapilli fall units in proximal and medial areas testifies to the erosive power of the intervening pyroclastic surges. The overlying member B was formed by many pyroclastic flows, radially distributed around Campi Flegrei, that varied widely in their eruptive and emplacement mechanisms. In some of the most proximal exposures coarse scoria and lithic-rich deposits, sometimes welded, have been identified at the base of member B. Isopach and isopleth maps of fall-units, combined with the distribution of the coarse proximal facies, indicate that the eruptive vent was located in the NE area of Campi Flegrei. It is considered that the NYT eruption produced collapse of a caldera approximately 10 km diameter within Campi Flegrei. The caldera rim, located by geological and borehole evidence, is now largely buried by the products of more recent eruptions. Initiation of caldera collapse may have been contemporaneous with the start of the second phase (member B). It is suggested that there was a single vent throughout the eruption rather than the development of multiple or ring vents. Chemical data indicate that different levels of a zoned trachyte-phonolite magma chamber were tapped during the eruption. The minimum volume of the NYT is calculated to be about 50 km3 (DRE), of which 35 km3 (∼70%) occurs within the caldera.